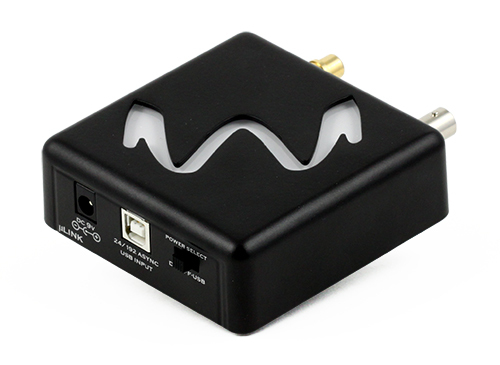 The µLINK is where top quality USB connectivity meets low jitter S/PDIF conversion. A high performance USB interface built around XMOS technology is the cornerstone for the mighty converter. Delivering low latency and low jitter communication is a fundamental building block to attain the best audio quality from your DAC. Seamless integration with any operating system ensures that this ‘link’ is built to last and can adapt to change. Designed into an ultra compact chassis with versatility in mind, the µLINK offers a selection of three output connector types that can be used simultaneously to drive independent systems. If your DAC is lacking the USB quality or compatibility needed to keep up with your high resolution music collection, look no further than the µLINK. Driverless for Mac and Linux systems! The μLINK gets my highest recommendation. 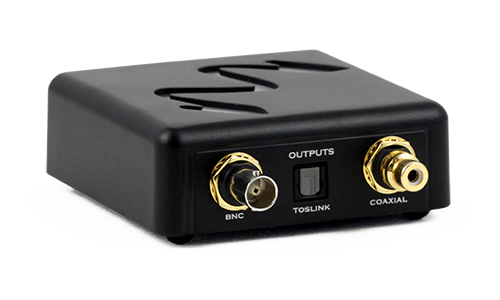 This little black box and its glowing blue logo can handle ALL sample rates up to and including 192kHz. Get one – and get satisfaction.